Permanently smooth, beautiful skin can now be yours with the most gentle, efficient, and affordable laser hair removal in Glendale. An excellent alternative to more painful hair removal methods like tweezing, waxing, and electrolysis (which uses a jolt of electricity instead of infrared light), 7Q Spa Medical Center’s laser hair removal treatment works by beaming concentrated laser light into hair follicles; when the pigment in these follicles absorbs the heat from the laser, it damages the follicle and prevents the regrowth of hair. Gentle and effective after only a few sessions, laser hair removal is ideal for both men and women searching for a permanent, easy way to rid themselves of unwanted and unsightly facial or body hair. Try it today; schedule a free consultation at our beautiful Glendale location! Laser hair removal works by destroying hair follicles with highly-concentrated beams of light. Because the laser’s wavelength is absorbed by only dark hairs, the skin around the treatment area is unharmed. Because each laser pulse takes only a fraction of a second, 7Q Spa’s laser hair removal can treat an area the size of a quarter every second. Small surfaces, like upper lips, can be treated in less than a minute! 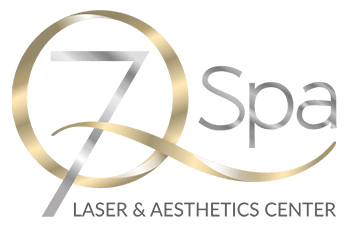 7Q Spa’s laser hair removal specialists are professional, thorough, and strive to help every client achieve their health and beauty goals. 90% of clients report permanent hair loss after as few as three sessions!